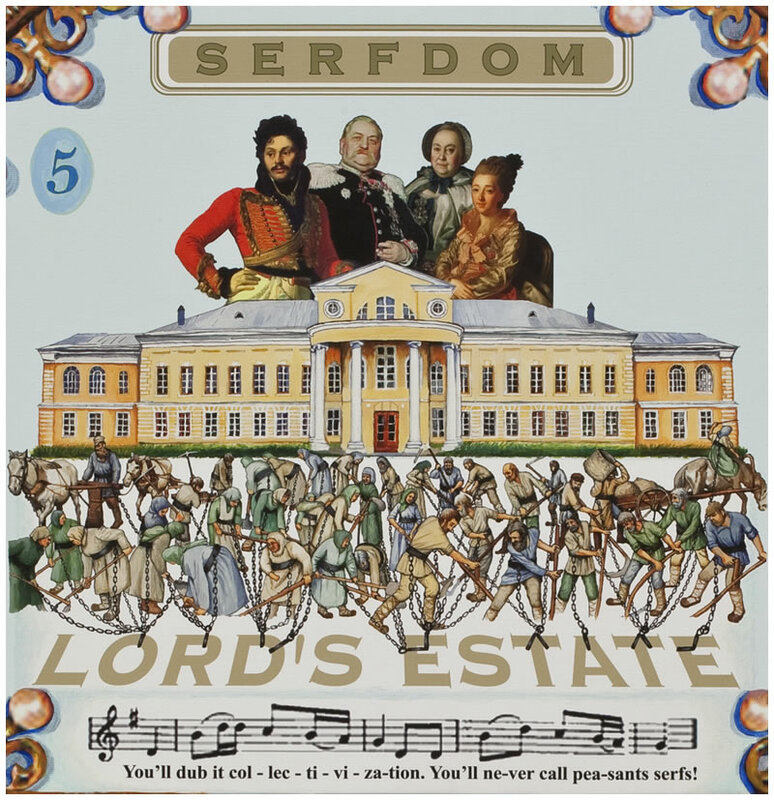 Available on Issue.com: art catalogue accompanying Peasants, Clans, and Effervescent Autocrats! 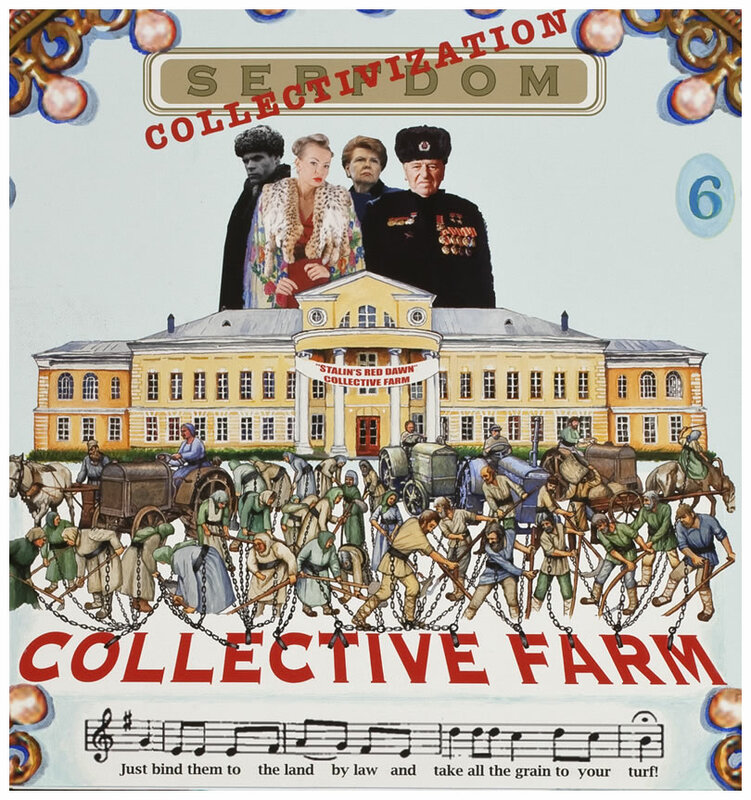 I’m thrilled to announce that the catalogue accompanying Columbia University’s Harriman Institute for Russian Studies exhibit of my art is now published on Issuu.com! The fully-illustrated catalogue will be available for free for the length of the exhibit. It’s an unusual, very personal artist’s catalogue with a sometimes-startling view into my artistic process and the history visualized my art. I hope you’ll take a quick look or a long look! Have fun with the magic of turning virtual pages! Best is to view in Full Screen. You can enlarge using the + icon on the bottom, and scroll around the enlarged page with the arrow, via dragging your mouse (like the hand on google maps). 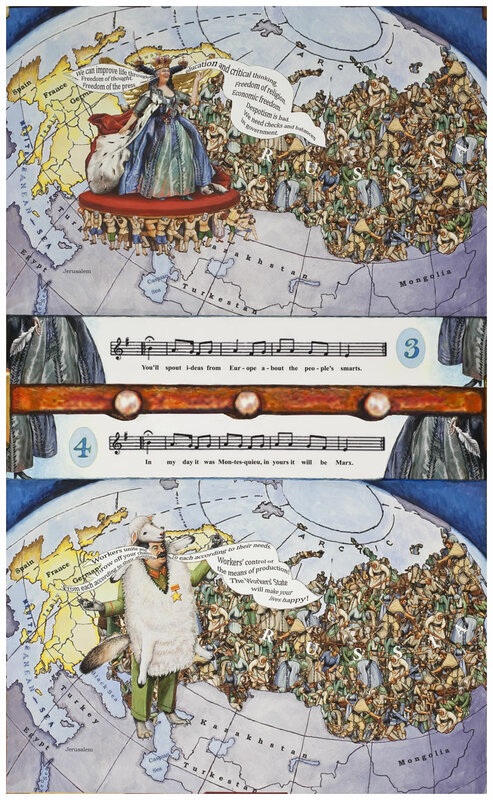 Playground of the Autocrats is a series of triptychs that I’ve been quietly working on in my own time, behind the scenes, for the last 4 or 5 years. 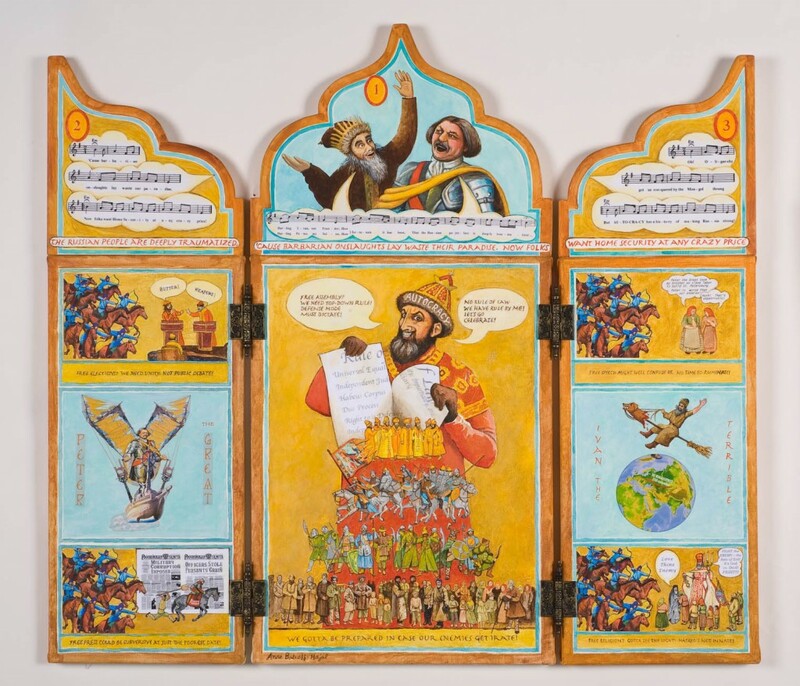 These mixed media triptychs are influenced by a combination of art animation and Russian history, icons, and folktale illustration. I consider them fine art, but until recently, I wasn’t sure whether anyone else would. 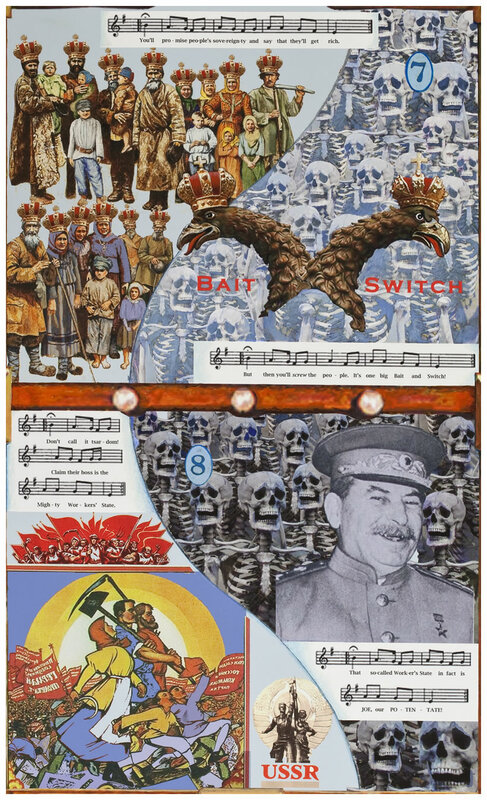 However, one of the series, individually titled Home Security at Any Crazy Price, was selected by Nan Rosenthal for a political art exhibit she curated in early 2009, Contemporary Confrontations, at the Katonah Art Museum in Westchester County, just north of New York City. The New York Times review of the show referred to my “Home Security” as an “homage to Joseph Cornell…filled with wonderful goodies.” So I now have Rosenthal’s and the Times’ official stamp that this work is indeed fine art…. Playground of the Autocrats involves a degree of detail that is probably more obsessional than I would like to admit. Each triptych has taken a good two years or so to complete. This is partly because they contain so many figures and other details, each of which is intensively researched. For example, as my models for the peasants I painted in Home Security’s center panel, I used photos of actual 19th century Russian peasants that I found via a lot of searching on the internet and in my old Russian history books. 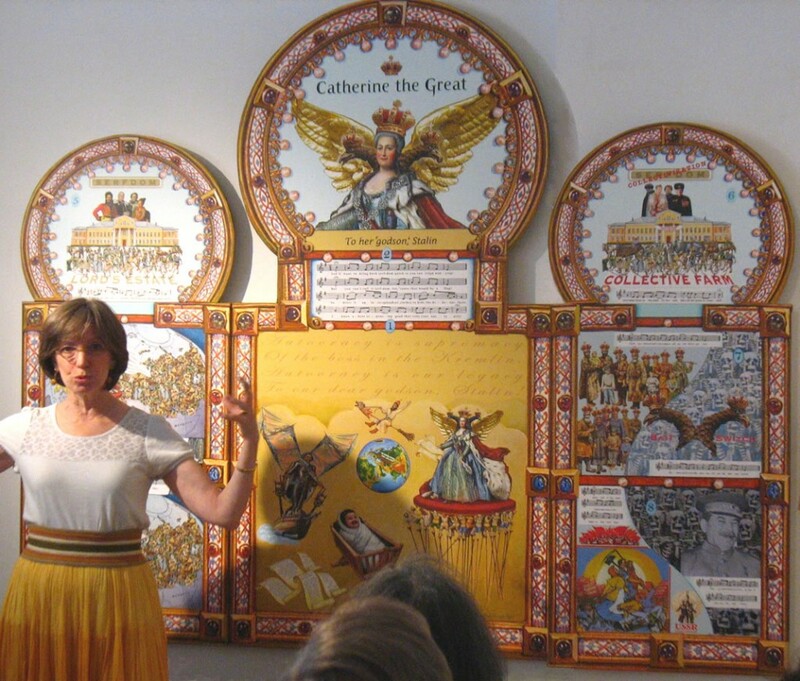 The military figures I painted are based on popular books on Russian military history, whose illustrations have in turn been researched by the authors and artists. 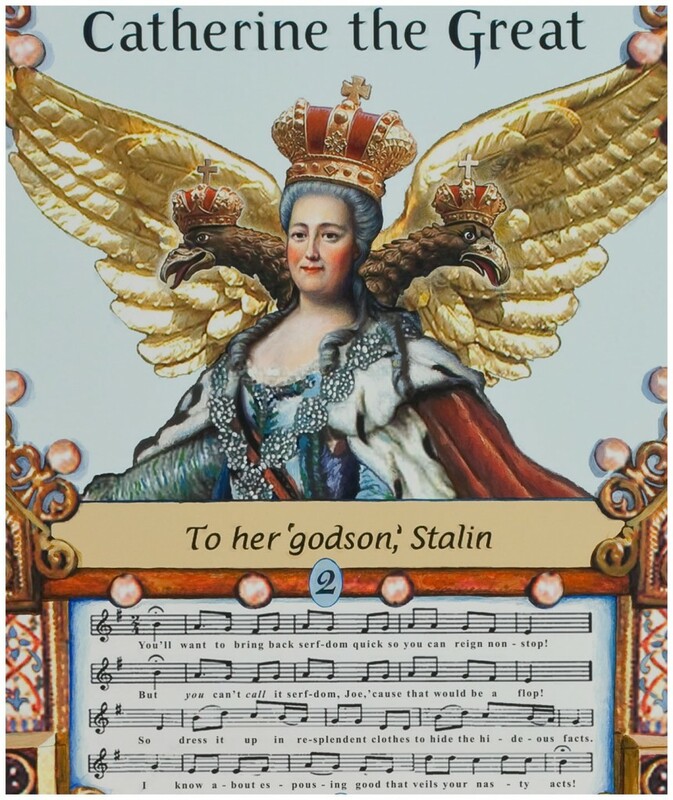 As for the Playground of the Autocrats characters (Peter the Great, Ivan the Terrible, and next Catherine the Great) who appear in each triptych, I carefully designed and collaged them together from odds and ends reflecting their true historical actions and times. I’ve endlessly worked over each verse of the lyrics they sing with the aid of my beloved Rhyming Dictionary by Rosalind Fergusson (the only rhyming dictionary organized to work the same way my brain does). Why do all this? one might ask. Sometimes I wonder myself. But the answer is that this is simply who I am as an artist. 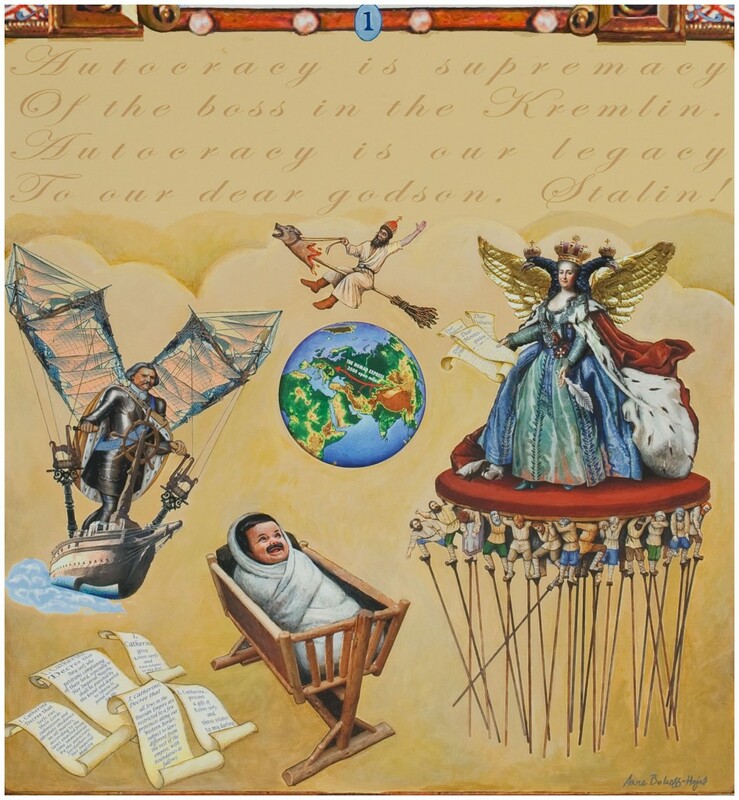 Still, preparing to launch this thread, I started searching around the internet trying to figure out which blogging category Playground of the Autocrats fits into best. Is what I’m doing conceptual art? Is it political art? But my goal isn’t to push a particular political agenda. I’m mainly interested in visualizing my ideas about social systems, Russia’s in particular, in a fun, whimsical, and moving way (I’ll make you laugh, I’ll make you cry). So maybe what I do is more akin to political cartoons? But my highly detailed work, designed to be gazed at for a long time, is different from political cartoons’ brilliant, quickly-readable commentary on single contemporary events. My work is about historical developments over the very long haul – centuries, not days. While I adore clever political cartoons, that’s not really what I’m doing. Maybe I do something closer to comics or graphic novels? But I don’t have any page-turning! And my work – though it’s quirky and (I hope) humorous – is more academically-minded. So am I into something like information visualization? Hmmm. While I’m captivated by the likes of Edward Tufte, I’m creating art, not social science. Above all, my goal is to evoke emotional and esthetic responses as well as thinking ones. In short, I don’t seem to fit into any single art or blog category. But I sure touch on a lot of them, many of which I find enthralling. I will refer to all in posts to come.